Unique emulsion gel with marine collagen, hyaluronic acid, and 25 herbal and plant extracts. 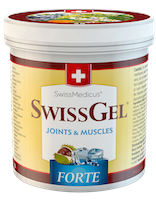 It is manufactured on basis of a traditional Swiss formula, and enriched with MSM, magnesium complex, and bioactive silicon from horsetail extract. 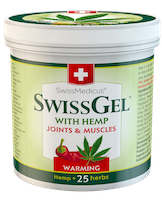 SwissGel® with CBD is a unique herbal balm made from 25 kinds of herbal and plant extracts according to the traditional Swiss recipe, enriched with CBD extract. Horse balsam – herbal liquid with spirit warming. The real relief with a rapid onset of action and without feeling grease. Unique product made from 25 kinds of herbal and plant extracts. 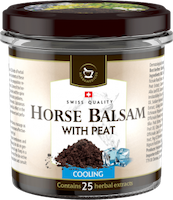 Horse balsam with peat is a unique balm made from peat and extracts of 25 kinds of herbs according to a traditional recipe, proven over generations. Horse balsam Sport Relax is a herbal balm specially developed for the needs of active athletes. Its cooling effect helps profound relaxing of the muscles, creates a feeling of relaxation. It is a fortified version of the unique balsam made from 25 herbs. Horse balsam Forte warming is made according to a traditional Swiss recipe. It contains the fruit and flowers of horse chestnut. Horse balsam – herbal liquid with spirit cooling. The real relief with a rapid onset of action and without feeling grease. Unique product made from 25 kinds of herbal and plant extracts. Horse balsam Sport start is a herbal balm specially developed for the needs of active athletes. Massage with the Sport balm stimulates blood circulation and thus heating of the treated area. Its major importance consists in its external application. It is used in the form of a compress for bruises, venous inflammations, chronic diseases, gout and varicose veins. 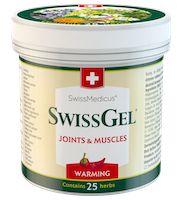 It helps bone fracture union as well as healing of wounds, swellings, ulcers and haemorrhages. Comfrey encourages the healing tissue production, however it should not be used for deep wounds as it accelerates the surface healing before the wound is able to heal inside, which can cause abscess formation. In herbalism it is widely recommended for open varicosities and crural ulcers. It is also used as tincture or in the form of healing oils. Effective substances: allantoin, asparagine, laziocarpine, methylpyrinine, essential oils, tannins, a number of other alkaloids. Horse chestnut is a tall tree originally coming from the Balkans. It was imported to our region in the 18th century. It was first described as a herb by Matthioli in the 16th century. In 1615 a French traveller brought it from Istanbul and planted it in Paris. During the subsequent 100 years it spread over the whole of Europe. Californian Indians threw crushed chestnut fruits in lakes and rivers to intoxicate fish which could then be more easily fished. In 1896 there was a reference to its healing effect for haemorrhoids. Effective substances: aescin, quercetin, kaempherol and others. “heavy legs”, speeding up bruise absorption, improving circulation in blood vessels eliminating blood coagulation and preventing thrombus formation. It is spread anywhere in Europe and Asia. Its European occurrence is nearly cosmopolitan. It can be found from lowlands up to mountain regions (Monte Rosa 3700 m a.s.l.). The Juniper’s healing glory originated in the Middle Ages when the Arabs made an unusual Juniper jam, presented in some older pharmacopoeias until now. For a long time, Juniper was associated with ritual purge and burnt in temples as a part of regular purging rituals. Several pharmacopoeias remained preserved on Egyptian papyruses coming from 1550 B.C. Internally it is used for urinary tract inflammations, flatulence and dyspepsia (digestive disorder – fermentation and putrefaction processes prevail in the intestines). 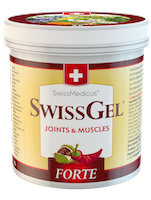 It improves metabolism in joints which, together with its diuretic properties, predetermines it for the treatment of joint rheumatism. Effective substances: essential oil is rich in monoterpenes – above all the terpinol.